"Ekranoplan" redirects here. For the album by Assemble Head in Sunburst Sound, see Ekranoplan (album). 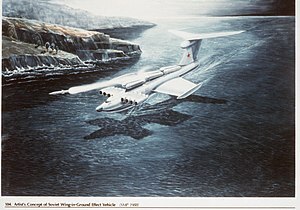 A ground-effect vehicle (GEV), also called a wing-in-ground-effect (WIG), ekranoplan (Russia) or wingship (US), is a vehicle that is designed to attain sustained flight over a level surface (usually over the sea) by making use of ground effect, the aerodynamic interaction between the wings and the surface. The type is typically intended to operate from water like a flying boat, but some can operate over any flat area such as frozen lakes or flat plains similar to a hovercraft. Early development of the Ekranoplan took place in the Soviet Union, culminating in the Caspian Sea Monster. In recent years[when?] a variety GEV types have been developed in Russia and elsewhere, for both civilian and military use. However, the design has yet to enter widespread use. A ground-effect vehicle needs some forward velocity to produce lift dynamically and the principal benefit of operating a wing in ground effect is to reduce its lift-dependent drag. The basic design principle is that the closer the wing operates to an external surface such as the ground, said to be in ground effect, the more efficient it becomes. An airfoil passing through air increases air pressure on the underside, while decreasing pressure across the top. The high and low pressures are maintained until they flow off the ends of the wings, where they form vortices which in turn are the major cause of lift-induced drag—normally a large portion of the drag affecting an aircraft. The higher the aspect ratio of the wing (that is, the longer and skinnier it is), the less induced drag created for each unit of lift and the greater the efficiency of the particular wing. This is the primary reason gliders have long and skinny wings. Placing the same wing near a surface such as the water or the ground has the effect of greatly increasing the aspect ratio, but without having the complications associated with a long and slender wing, so that the short stubs on an Ekranoplan can produce just as much lift as the much larger wing on a transport aircraft, though it can only do this when close to the earth's surface. Once sufficient speed has built up, some GEVs may be capable of leaving ground effect and functioning as normal aircraft until they approach their destination. The distinguishing characteristic is that they are unable to land or take off without a significant amount of help from the ground effect cushion, and cannot climb until they have reached a much higher speed. A GEV is sometimes characterized as a transition between a hovercraft and an aircraft, although this is not correct as a hovercraft is statically supported upon a cushion of pressurised air from an onboard downward-directed fan. Some GEV designs, such as the Russian Lun and Dingo, have used forced blowing under the wing by auxiliary engines to increase the high pressure area under the wing to assist the takeoff; however they differ from hovercraft in still requiring forward motion to generate sufficient lift to fly. Although the GEV may look similar to the seaplane and share many technical characteristics, it is generally not designed to fly out of ground effect. It differs from the hovercraft in lacking low-speed hover capability in much the same way that a fixed-wing airplane differs from the helicopter. Unlike the hydrofoil, it does not have any contact with the surface of the water when in "flight". The ground-effect vehicle constitutes a unique class of transportation. WIG-wings configurations: (A) Ekranoplan; (B) Reverse-delta wing; (C) Tandem wing. Used by the Russian Rostislav Alexeyev for his ekranoplan. The wings are significantly shorter than those of comparable aircraft, and this configuration requires a high aft-placed horizontal tail to maintain stability. The pitch and altitude stability comes from the lift slope[note 1] difference between a front low wing in ground-effect (commonly the main wing) and an aft, higher-located second wing nearly out of ground-effect (generally named a stabilizer). Developed by Alexander Lippisch, this wing allows stable flight in ground-effect through self-stabilization. This is the main Class B form of ground-effect craft. A biplane-style type-1 utilising a shoulder-mounted main lift wing and belly-mounted sponsons similar to those on combat and transport helicopters. A canard-style type-2 with a mid-size horizontal wing[note 2] near the nose of the craft directing airflow under the main lift airfoil. This type-2 tandem design is a major improvement during takeoff, as it creates an air cushion to lift the craft above the water at a lower speed, thereby reducing water drag, which is the biggest obstacle to successful seaplane launches. A tandem wing style with double-wing system as tandem-airfoil flairboat constructions by the aerodynamic specialist Dipl. Ing. Günther W. Jörg. This system is self-stabilizing and provides secure, comfortable and high-efficiency operation. Given similar hull size and power, and depending on its specific design, the lower lift-induced drag of a ground-effect craft, as compared to an aircraft of similar capacity, will improve its fuel efficiency and, up to a point, its speed. Ground-effect craft also are much faster than surface vessels of similar power, because they avoid drag from the water. On the water the aircraft-like construction of ground-effect craft increases the risk of damage, should they fail to avoid other vessels. Furthermore, the limited number of egress points make it more difficult to evacuate the vehicle in an emergency. Since most ground-effect craft are designed to operate from water, accidents and engine failure typically are less hazardous than in a land-based aircraft, but the lack of altitude control leaves the pilot with fewer options for avoiding collision, and to some extent that discounts such benefits. Low altitude brings high speed craft into conflict with ships, buildings and rising land, which may not be sufficiently visible in poor conditions to avoid, and the ground-effect vehicle may be unable to climb over or turn sharply enough to avoid collisions while drastic, low level maneuvers risk contact with solid or water hazards beneath. Aircraft can climb over most obstacles, but ground-effect vehicles are more limited. In high winds, take-off must be into the wind, which takes the craft across successive lines of waves, causing heavy pounding, which both stresses the craft and makes passengers uncomfortable. In light winds, waves may be in any direction, which can make control difficult as each wave causes the vehicle to both pitch and roll. Their light construction makes their ability to operate in higher sea states less than that of conventional ships, but greater than the ability of hovercraft or hydrofoils, which are closer to the surface of the water. The demise of the seaplane was a result of its inability to take off or land in rough sea conditions even while flying conditions were good, and its use only lasted until runways were more commonly available. Ground-effect vehicles are similarly limited. Like conventional aircraft, greater power is needed for takeoff, and, like seaplanes, ground-effect vehicles must get on the step before they can accelerate to flight speed. Careful design, usually with multiple redesigns of hullforms, is required to get this right, which increases engineering costs. This obstacle is more difficult for ground-effect vehicles with short production runs to overcome. For the vehicle to work, its hull needs to be stable enough longitudinally to be controllable yet not so stable that it cannot lift off the water. The bottom of the vehicle must be formed to avoid excessive pressures on landing and taking off without sacrificing too much lateral stability, and it must not create too much spray, which damages the airframe and the engines. The Russian Ekranoplans show evidence of fixes for these exact problems in the form of multiple chines on the forward part of the hull undersides and in the forward location of the jet engines. Finally, limited utility has kept production levels low enough that it has been impossible to amortize development costs sufficiently to make ground-effect vehicles competitive with conventional aircraft. A 2014 NASA study claims that use of Ground effect vehicles for passenger travel will lead to cheaper flights, increased accessibility and less	pollution. One difficulty which has delayed GEV development is the classification and legislation to be applied. The International Maritime Organization has studied the application of rules based on the International Code of Safety for High-Speed Craft (HSC code) which was developed for fast ships such as hydrofoils, hovercraft, catamarans and the like. The Russian Rules for classification and construction of small type A ekranoplans is a document upon which most GEV design is based. However, in 2005, the IMO classified the WISE or GEV craft under the category of ships. A craft which is certified for operation outside ground effect and exceeding 150 metres (490 ft) above the surface. These classes currently only apply to craft carrying 12 passengers or more. By the 1920s, the ground effect phenomenon was well-known, as pilots found that their airplanes appeared to become more efficient as they neared the runway surface during landing. In 1934 the US National Advisory Committee for Aeronautics issued Technical Memorandum 771, Ground Effect on the Takeoff and Landing of Airplanes, which was a translation into English of a summary of research up to that point on the subject. The French author Maurice Le Sueur had added a suggestion based on this phenomenon: "Here the imagination of inventors is offered a vast field. The ground interference reduces the power required for level flight in large proportions, so here is a means of rapid and at the same time economic locomotion: Design an airplane which is always within the ground-interference zone. At first glance this apparatus is dangerous because the ground is uneven and the altitude called skimming permits no freedom of maneuver. But on large-sized aircraft, over water, the question may be attempted ..."
By the 1960s, the technology started maturing, in large part due to the independent contributions of Rostislav Alexeyev in the Soviet Union and German Alexander Lippisch, working in the United States. Alexeyev worked from his background as a ship designer whereas Lippisch worked as an aeronautical engineer. The influence of Alexeyev and Lippisch remains noticeable in most GEV vehicles seen today. Led by Alexeyev, the Soviet Central Hydrofoil Design Bureau (Russian: ЦКБ СПК) was the center of ground-effect craft development in the USSR. 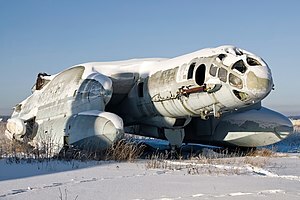 The vehicle came to be known as an ekranoplan (Russian: экранопла́н, экран screen + план plan, from Russian: эффект экрана, literally screen effect, or ground effect in English). The military potential for such a craft was soon recognized and Alexeyev received support and financial resources from Soviet leader Nikita Khrushchev. Some manned and unmanned prototypes were built, ranging up to eight tons in displacement. This led to the development of a 550-ton military ekranoplan of 92 m (302 ft) length. The craft was dubbed the Caspian Sea Monster by U.S. intelligence experts, after a huge, unknown craft was spotted on satellite reconnaissance photos of the Caspian Sea area in the 1960s. With its short wings, it looked airplane-like in planform, but would obviously be incapable of flight. Although it was designed to travel a maximum of 3 m (9.8 ft) above the sea, it was found to be most efficient at 20 m (66 ft), reaching a top speed of 300–400 kn (560–740 km/h; 350–460 mph) in research flights. The Soviet ekranoplan program continued with the support of Minister of Defence Dmitriy Ustinov. It produced the most successful ekranoplan so far, the 125-ton A-90 Orlyonok. These craft were originally developed as high-speed military transports and were usually based on the shores of the Caspian Sea and Black Sea. The Soviet Navy ordered 120 Orlyonok-class ekranoplans, but this figure was later reduced to fewer than 30 vessels, with planned deployment mainly in the Black Sea and Baltic Sea fleets. A few Orlyonoks served with the Soviet Navy from 1979 to 1992. In 1987, the 400-ton Lun-class ekranoplan was built as a missile launcher. A second Lun, renamed Spasatel, was laid down as a rescue vessel, but was never finished. The two major problems that the Soviet ekranoplans faced were poor longitudinal stability and a need for reliable navigation. Minister Ustinov died in 1985, and the new Minister of Defence, Marshal Sokolov, cancelled funding for the program. Only three operational Orlyonok-class ekranoplans (with revised hull design) and one Lun-class ekranoplan remained at a naval base near Kaspiysk. Since the dissolution of the Soviet Union, ekranoplans have been produced by the Volga Shipyard in Nizhniy Novgorod. Smaller ekranoplans for non-military use have been under development. 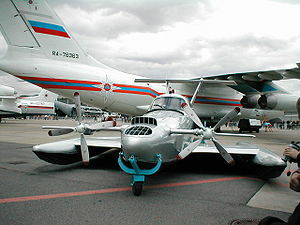 The CHDB had already developed the eight-seat Volga-2 in 1985, and Technologies and Transport is developing a smaller version called the Amphistar. 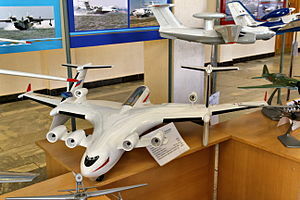 Beriev proposed a large craft of the type, the Be-2500, as a "flying ship" cargo carrier, but nothing came of the project. The Rhein-Flugzeugbau X-114 in flight. In Germany, Lippisch was asked to build a very fast boat for American businessman Arthur A. Collins. In 1963 Lippisch developed the X-112, a revolutionary design with reversed delta wing and T-tail. This design proved to be stable and efficient in ground effect and even though it was successfully tested, Collins decided to stop the project and sold the patents to a German company called Rhein Flugzeugbau (RFB), which further developed the inverse delta concept into the X-113 and the six seat X-114. These craft could be flown out of ground effect so that, for example, peninsulas could be overflown. Hanno Fischer took over the works from RFB and created his own company, Fischer Flugmechanik, which eventually completed two models. The Airfisch 3 carried two persons, and the FS-8 carried six persons. The FS-8 was to be developed by Fischer Flugmechanik for a Singapore-Australian joint venture called Flightship. Powered by a V8 Chevrolet automobile engine rated at 337 kW, the prototype made its first flight in February 2001 in the Netherlands. The company no longer exists but the prototype craft was bought by Wigetworks, a company based in Singapore and renamed as AirFish 8. In 2010, that vehicle was registered as a ship in the Singapore Registry of Ships. The University of Duisburg-Essen is supporting an ongoing research project to develop the Hoverwing. German engineer Günther Jörg, who had worked on Alexeyev's first designs and was familiar with the challenges of GEV design, developed a GEV with two wings in a tandem arrangement, the Jörg-II. It was the third, manned, tandem-airfoil boat, named "Skimmerfoil", which was developed during his consultancy period in South Africa. It was a simple and low-cost design of a first 4-seater tandem-airfoil flairboat completely constructed of aluminium. The prototype has been in the SAAF Port Elizabeth Museum since 4 July 2007, remained there till (2013) and is now in private use. Pictures of the museum show the boat after a period of some years outside the museum and without protection against the sun. The consultancy of Dipl. Ing. Günther Jörg who was specialist and insider of German Airplane Industrie up from 1963 and a colleague of Alexander Lippisch and Hanno Fischer as well, was founded with a fundamental knowledge of Wing in ground effect physics, as well as results of fundamental tests under different conditions and designs having begun in 1960. During a period of more than 30 years Dipl. Ing. Gunther W. Jörg managed to built and fly successful a series of 15 different tandem-airfoil flairboats in different sizes and made of different materials. TAF VII-5: Second manned tandem-airfoil Flairboat, 2 seater made of wood. TAF VIII-1: 2-seater tandem-airfoil flairboat built of GRP / Aluminium. A small serie of 6 Flairboats had been produced by former Botec Company. TAF VIII-3: 8-seater tandemIrfoil Flairboat built of aluminium combined with GRP parts. TAF VIII-4: 12-seater tandem Airfoil Flairboat built of aluminium combined with GRP parts as well. TAF VIII-3B: 6-seater tandem-airfoil flairboat under carbon fibre composite construction. Bigger concepts are: 25-seater, 32-seater, 60-seater, 80-seater and bigger up to the size of a passenger airplane. All those tandem-airfoil flairboats are registered as motorboat and classified as type A WIG. In 1984, Gunther W. Jörg was decorated with "Philip Morris Award" for future transportation. In 1987, the Botec Company was founded. After his death in 2010 business is continued by his daughter and former assistant Ingrid Schellhaas with her company Tandem WIG Consulting. GEVs developed since the 1980s have been primarily smaller craft designed for the recreational and civilian ferry markets. Germany, Russia and the United States have provided most of the momentum with some development in Australia, China, Japan, Korea and Taiwan. In these countries and regions, small craft up to ten seats have been designed and built. Other larger designs as ferries and heavy transports have been proposed, but have not been carried to fruition. Besides the development of appropriate design and structural configuration, special automatic control systems and navigation systems are also being developed. These include special altimeters with high accuracy for small altitude measurements and also lesser dependence on weather conditions. After extensive research and experimentation, it has been shown that "phase radio altimeters" are most suitable for such applications as compared to laser altimeter, isotropic or ultrasonic altimeters. With Russian consultation, the United States Defense Advanced Research Projects Agency (DARPA) studied Aerocon's 170-metre long (550-foot) wingship. Universal Hovercraft developed a flying hovercraft, a prototype of which first took flight in 1996. Since 1999, the company has offered plans, parts, kits and manufactured GEV hovercraft called the Hoverwing. In Singapore, Wigetworks has continued development and obtained certification from Lloyd's Register for entry into class. On 31 March 2011 AirFish 8-001 became one of the first WIG to be flagged with the Singapore Registry of Ships, one of the largest ship registries. Wigetworks has also partnered with National University of Singapore's Engineering Department to develop higher capacity WIG craft. In Korea, Wing Ship Technology Corporation has developed and tested a 50-seat passenger version of a WIG craft named the WSH-500. Iran deployed three squadrons of Bavar 2 two-seat GEVs in September, 2010. This GEV carries one machine gun and surveillance gear, and incorporates features which reduce its radar signature in a similar manner to stealth. In October 2014, satellite images showed new images of the Ekranoplan in a shipyard in south of Iran. The Ekranoplan has two engines and no armament. The designers Burt Rutan in 2011 and Korolev in 2015 have shown ekranoplan projects. Estonian transport company Sea Wolf Express plans to launch passenger service in 2019 between Helsinki and Tallinn, a distance of 87 km taking only half an hour, using a Russian-built ground effect vehicle (GEV). The company has ordered 15 GEVs with maximum speed of 185 km/h and capacity of 12 passengers and they are built by Russian RDC Aqualines. ^ Cl/da, with Cl = lift coefficient, and a = angle of incidence. ^ Not a stabilizer because destabilizing. ^ Sub-Committee on Ship Design and Equipment (DE) (November 2001). "Wing-in-Ground (WIG) craft". International Maritime Organization. Retrieved 16 January 2014. ^ "International Maritime Organization." International Maritime Organization. Retrieved: 30 December 2011. ^ Garrison 2011, pp. 80–83. ^ May, James. "Riding the Caspian Sea Monster." BBC, 27 September 2008. ^ Garrison 2011, p. 82. ^ "Volga Shipyard". Joint Stock Company Volga Shipyard, 2011. Retrieved: 30 December 2011. ^ "Be-2500 amphibious aircraft". Beriev Aircraft Company. ^ Taylor, John W R (1978). Jane's All the World's Aircraft 1978–79. London: Jane's Yearbooks. pp. 70–1. ISBN 0 35 400572 3. ^ "FS-8". Archived 2011-07-18 at the Wayback Machine The WIG page, 2008. Retrieved: 30 December 2011. ^ "Wigetworks." Wigetworks Private Limited. Retrieved: 22 August 2011. ^ "The Ground Effect Craft 'Hoverwing.'" Archived 2007-10-09 at the Wayback Machine Technische Entwicklung von Bodeneffektfahrzeugen, Universitat Duisburg-Essen, 1 March 2000. Retrieved: 1 October 2007. ^ "Skimmerfoil Jörg IV." Archived 2013-09-29 at Archive.today SAAF, 5 July 2007. Retrieved: 29 September 2013. ^ Gaines, Mike. "USA joins Russia on Wingship" (PDF). Flight International (March 11-17, 1992). p. 5. Retrieved 31 August 2018. ^ Dane, Abe (May 1992). "Wingships: Massive wing-in-ground-effect flyers combine jetliner speeds with steamship economy". Cover story. Popular Mechanics. 169 (5). pp. 35–38, 123. ^ Frederick, Donald (September 19, 1993). "Giant Soviet Airship Could Evolve Into Cruise Ship or Winged Hospital : Aviation: The 540-ton Caspian Sea Monster would be reborn as a 5,000-ton 'wingship' if one American has his way. The original, built in '60s, crashed in '70s". Los Angeles Times. National Geographic. Retrieved 30 August 2018. ^ Advanced Research Projects Agency (ARPA) (September 30, 1994). Final Report (PDF). Wingship Investigation. 1. Arlington, Virginia. Retrieved 31 August 2018. Lay summary. ^ Advanced Research Projects Agency (ARPA) (September 30, 1994). Appendices (PDF). Wingship Investigation. 2. Arlington, Virginia. Retrieved 31 August 2018. Lay summary. ^ Advanced Research Projects Agency (ARPA) (September 30, 1994). Technology Roadmap (PDF). Wingship Investigation. 3. Arlington, Virginia. Retrieved 31 August 2018. Lay summary. ^ "Hoverwing® 19XRW manufactured craft." Hovercraft.com. Retrieved: 14 March 2011. ^ Hirdaris, Spyros and Mark Guerrier. "Technology Developments in Grou nd Effect Craft." 2nd Annual Ship Tech 2009, Dubai, 8–9 November 2009. Retrieved: 30 December 2011. ^ Young, Lam Yi. "Speech at the christening of the Wing-In-Ground craft, AirFish 8-001." Harbor and Port Authority of Singapore, 25 April 2010. Retrieved: 30 December 2011. ^ "Engineering students to help in developing future WIG vessels." National University of Singapore, 2009. Retrieved: 30 December 2011. ^ Lendon, Brad. "Iran unveils squadrons of flying boats." CNN.com, 28 September 2010. Retrieved: 11 October 2010. ^ "DUBAI: Burt Rutan reveals secret ekranoplan project". flightglobal.com. 14 November 2011. Retrieved 6 April 2018. ^ "MAKS: Can Russia's 'Caspian Sea Monster' rise again?". flightglobal.com. 28 August 2015. Retrieved 6 April 2018. ^ ERR (5 January 2018). "Estonian company hopes to launch Tallinn-Helsinki GEV service in 2019". err.ee. Retrieved 6 April 2018. ^ "Virolaisyrityksellä hurja visio: Helsinki–Tallinna-väli puolessa tunnissa pintaliitäjällä?". mtv.fi. Retrieved 6 April 2018. Abramowski. Tomasz. "Numerical Investigation of Airfoil in Ground Proximity." Warsaw: Theoretical and Applied Mechanics, 45, 2, 2007, pp. 425–36. Aubin, S.Y. and John de Monchaux. Easy Ways to Study Ground Effects. EAGES 2001 International Ground Effect Symposium. Toulouse, France, June 2001. Fishwick, S. Low Flying Boats. Thorpe Bay, Southend-on-Sea, Essex, UK: Amateur Yacht Research Society, 2001. ISBN 0-85133-126-2. Forsberg, Randall. The Arms Production Dilemma: Contraction and Restraint in the World Combat Aircraft Industry. Boston: The MIT Press, 1995. ISBN 978-0-262-56085-6. Garrison, Peter. "Faster than a Boat." Flying, September 2011. Gunston, Bill. The Osprey Encyclopedia of Russian Aircraft. Oxford, UK: Osprey, 2000. ISBN 978-1-84176-096-4. Hirschel, Ernst Heinrich, Horst Prem and Gero Madelung. Aeronautical Research in Germany: From Lilienthal Until Today. Berlin: Springer-Verlag and Heidelberg GmbH & Co. K., 2003. ISBN 978-3-540-40645-7. Komissarov, Sergey and Yefim Gordon. Soviet and Russian Ekranoplans. Hersham, UK: Ian Allan Publishing, 2010. ISBN 978-1-85780-332-7. McGraw-Hill Dictionary of Scientific and Technical Terms. New York: McGraw-Hill Professional, 2002. ISBN 978-0-07-042313-8. Nebylov, Prof.A.V. Ekranoplanes: Controlled Flight Close to the Sea. Southampton, UK: WIT Press, 2002. Rozhdestvensky, Kirill V. Aerodynamics of a Lifting System in Extreme Ground Effect. Berlin: Springer-Verlag and Heidelberg GmbH & Co. K., 2002. ISBN 978-3-540-66277-8. Sharan, Sukrit (Aerospace Trainee from India). "Complex Algorithms of Parameters Measuring Systems for Motion Close to the Sea." IX Conference for Young Scientists, CSRI-ELEKTROPRIBOR, St. Petersburg, Russia, March 2007. Sharan, Sukrit (Aerospace Trainee from India). "Quality Measurement Criteria for Flight Close to the Sea Surface." Seminar on Aeronautics & Space, University of Aerospace Instrumentation, St. Petersburg, Russia, 9–13 April 2007. An overview of WIG vehicles for military operations (Technical report). RTO technical report. TR-AVT-081. North Atlantic Treaty Organization (NATO), Research and Technology Organization (RTO), Applied Vehicle Technology (AVT) Panel, Task Group AVT-081. December 2006. doi:10.14339/RTO-TR-AVT-081. OCLC 1085143242. Lay summary. Wikimedia Commons has media related to Ground effect vehicles.